A tale of moths and men. Rain stopped trapping last night, but I've a backlog of interesting arrivals to show off. Here, for example, is this year's earliest Early Thorn, with its distinctive way of resting, wings held upwards like a butterfly rather than folded over its back. A Pebble Hook Tip next, whose raked wings I've earlier compared to a Star Wars jet. 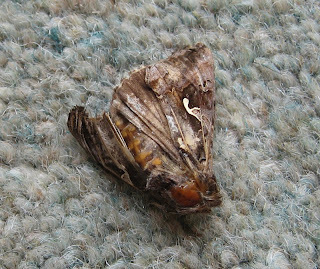 Sorry about all these similes and metaphors, but moths' extraordinary variety prompts them. I do like these distinctive ones, compared with the worthy but plainer Quakers and Drabs. And lastly, a very interesting moth called the Pale Pinion. After reading Waring & Co, I doubted my identification because in 2003 they described it as local in the North and not very likely to be found. But I couldn't see anything else similar and so Googled, which brought up some other interesting Yorkshire/mothy websites, all of which are recording Pale Pinions. So it seems to be moving North and it's very welcome. The patterning is yet another variety in the wonderful range, a sort-of quiver of straw-coloured arrows slung on the insect's back. This Pinion is taking an interest in eggbox architecture. I'm not sure what the circular structure is but will check. Actually I just rechecked Waring et al and the change in this moth's distribution really is interesting. They have it as local or as they say 'thinly distributed' in various parts of the UK such as the South, Midlands and North West, but no mention of Yorkshire and the North East. No doubt the county moth recorders are putting this right. I must remember to send ours my list at the end of the season. Oh good, another favourite has made its debut: the handsome Herald which features on the spine of Waring, Townsend and Lewington's Field Guide to the Moths of Great Britain and Ireland (British Wildlife Publishing), my Bible. I know I've mentioned this book many times but it cannot be praised too often. Isn't the Herald fine? The patterning is not only complicated but brightly coloured, which makes a change from most of its worthy but somewhat dull companions at this time of year. Checking back through the blog for previous mentions of it, I've realised how early I'm trapping. Last year I had one night, on 26th April, and only eight in May, because of going on holiday to the US. In 2009, I didn't start at all until June. Interestingly, my previous mention of the Herald was on 20th September 2008; the species has two flying seasons: one now, after hibernation, and the other from August, when the children of this generation will hatch, until November, when surviving ones turn in for their long winter sleep. One subject Waring and pals don't often mention is moths' legs. I'm so taken by the Herald's that I've added a picture of them: like spindly little zebra crossing: black,white,black white. As for the name, I haven't yet found a good guide to the fascinating subject of nomenclature among moths (see, for example, Ben's Comment on the post below), but I assume the Herald is partly derived from its early flying season, and partly from its vaguely mediaeval colouring and shape, like a tabard or upside-down shield. Its botanical name is a corker: Scoliopteryx libatrix, which actually dates back to Linnaeus in 1758. Another demure new arrival: the Grey Birch, one of many British moths who resemble pallid figures from a Bronte or Austen novel. But welcome too, and if you click on the pic, you'll see how delicately lovely the patterning is. In the manner of a Jane Eyre governess, this one appears to be reading the eggbox batch number. A new arrival last night - this Lunar Marbled Brown. It's always exciting when you see something nestling in the egg boxes which has never been there before. The moth gets its name from the little curved moon on its sumptuously patterned wings. Note that my almost equally beautiful thumb has one too. I used to be fascinated as a child by fingernail moons and still intend to discover one day why we have them. There was a very fine actual Moon last night too, just to complete this lunar trio. The Lunar Marbled Brown seems to be another species which is extending its range North. Waring, Townsend and Lewington describe the species as well-distributed South of the Wash but more local elsewhere. Interestingly, the two other Marbled Browns are much rarer. The plain old Marbled Brown is local everywhere and the Dusky Marbled Brown is a rare immigrant/possible former resident. A moth ex-pat, although I've never had one paying a nostalgic visit back here. The Met Office forecast the warmest day of the year so far. I keep wondering if the nice weather will affect the election, not so much in turnout as a feeling that things aren't so bad after all, which could give a point or two to Gordon Brown. The sun has come out and so have the butterflies. The nights remain cold, and the moths are staying in. That seems to be the situation at the moment, with only a smattering of Early Greys, Drabs and Quakers dozing in the egg boxes of a morning. Hence a bit of a gap since I last posted, and I've also been away - down on the Malvern Hills from which today's exciting and complicated photos come. Chris Thomond and I were on the British Camp making the latest of our Britain's Best Views extravaganza of films for the Guardian website and we diverted to West Malvern to do a bit on the water; they have the wonderful Hayslad gusher there - pure Malvern Water streaming free from a double-headed brass pipe. A non-stop succession of people called by with jerrycans while we were there, some from as far away as Birmingham and one topping up his car battery with the (naturally distilled) stuff. 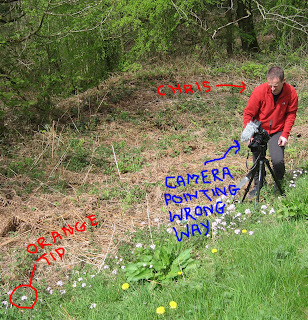 Opposite the gusher there was a pretty clump of that lovely Spring flower which I call Milkmaids - aka Lady's Smock or Cuckoo Flower, and we filmed this to go with some bluebells as typical of the abundant flora and fauna of the hills. Don't let anyone tell you that Britain's wildflowers are a thing of the past. They are everywhere. 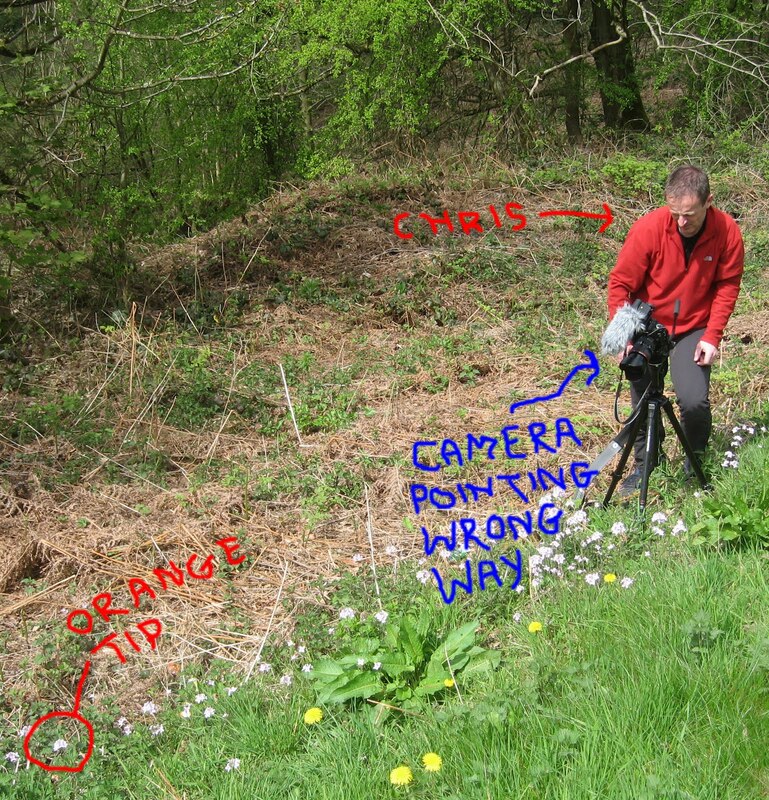 And while Chris filmed away, I wisely observed: "Milkmaids are excellent because they attract Orange Tip butterflies..."
And Lo! Into the scene fluttered a newly-hatched male OT, which then led us a merry dance as the main picture shows (plus the massively blown-up detail here in the small one, just above, left). It was like the badgers in the Fast Show. We got film of it in the end, though, and here's my own pic of it, fortuitously with its proboscis busying away, like a child sticking their tongue out in a school photograph. This all happened on Monday but it's Tuesday now and there's another male Orange Tip fluttering daintily round our garden here in Leeds. Only the males have the orange, but both sexes are graced with the wonderful delicate greeny-grey patterning on their hind underwings which you can just see in the pic. We've just celebrated Tamil New Year with our excellent in-laws. A green woodpecker hopped around their garden in Dorridge, south of Birmingham, which has to be a good omen. I tried to photograph it but failed completely. Ditto my efforts to stalk the first Orange Tip of 2010 back here at home. 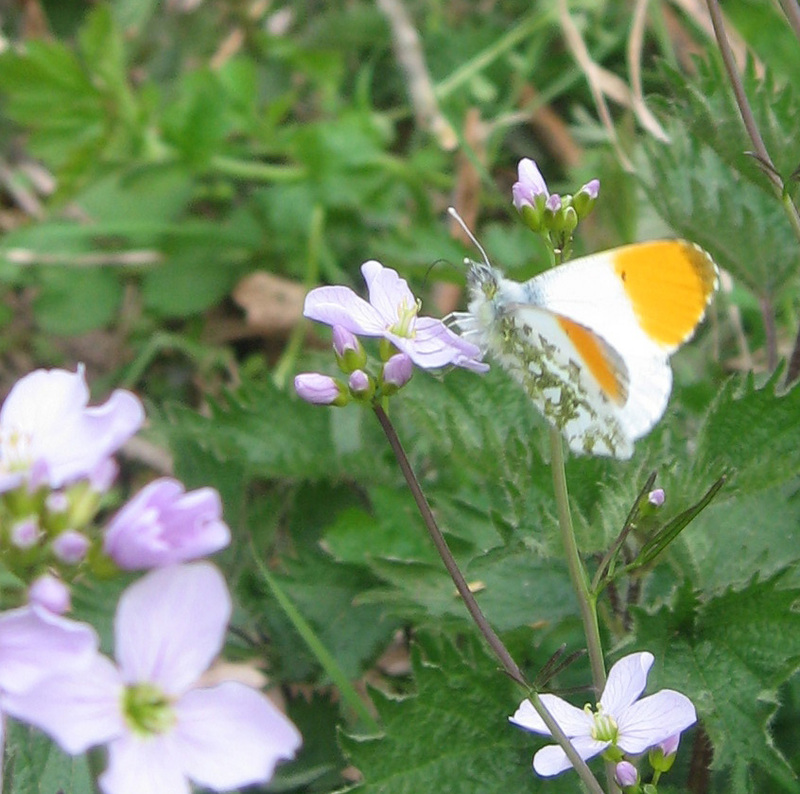 It was like the badger spotter in The Fast Show; whenever I looked out of the window, the Orange Tip was there; by the time I got outside with my camera, it wasn't. 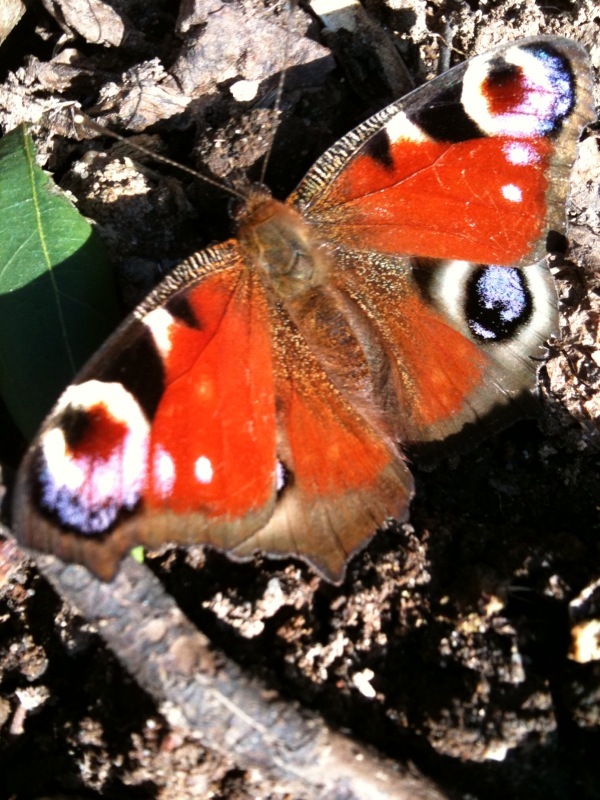 Luckily Radha, mum to our lovely daughter-in-law Abi, has stepped in and sent me this photo of a Peacock which she took with her mobile phone. 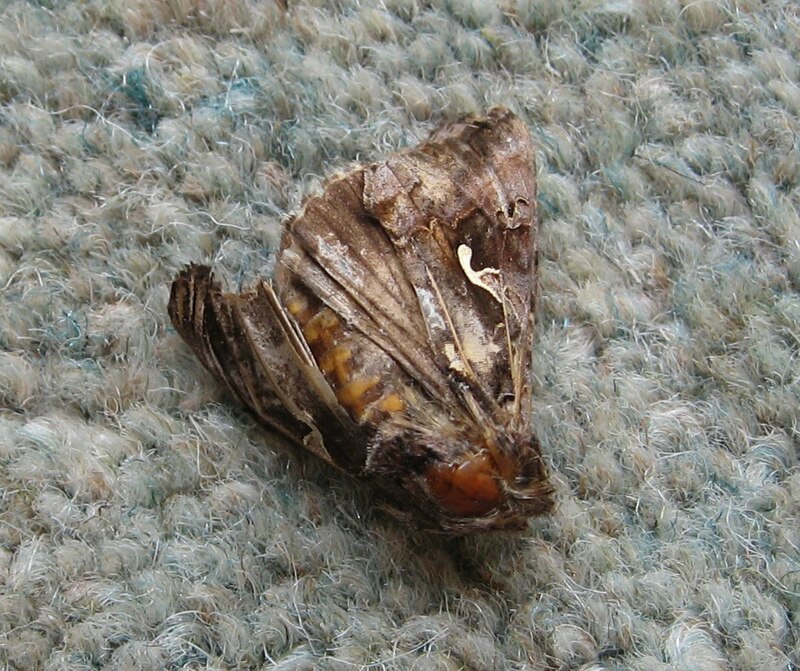 Also, as divine punishment for my teasing Steve Thorpe over his nine moths, I got just ONE in the trap the night before last, a solitary Hebrew Character. It was freezing cold which I suspect has sent all sensible moths to re-hibernate for a spell. Lean times. But it doesn't matter. Summer is on the way. Here's today's brilliant Jessiebug from Borneo. I think (and hope) that's it's old skin, rather than a mate who's been cannibalised. Rain stopped trapping last night, but Nature is exuberantly busy elsewhere in the garden. And indeed the house. We came into the kitchen to find a crow (no it's a jackdaw - see Steve Thorpe's helpful comment) had come down the chimney, somehow avoided death in our fake flame gas fire, and got into the usual state of panic on the windowsill. We eventually ushered it out of the back door with cooing noises and a broom. Much as I like birds, I wish the crows (sorry, jackdaws) wouldn't nest on top of our chimneys. I pot at them ineffectively with my sons' old BB gun; but maybe the horrors experienced by this one bird may put them off, if it has the means to describe or at least communicate the nature of its awful time. Meanwhile, our customary ladybrid infestation continues apace. This red-on-black one had chosen a dangerously intimate place to explore. I'll leave you to guess what the porcelain background portends. Ladybirds are everywhere in our house overwinter; lift a window and ye shall find them, unjam a door and they are there. Aphids beware! I've been exchanging comments with Steve Thorpe of Derbyshire about the Early Grey - he had an impressive five of them in his trap the other day. I've had one visiting regularly this week - a welcome change from the current mixture of Friends' meeting house (17 assorted Quaker moths last night) and synagogue (nine Hebrew Characters) which the trap resembles. I say 'welcome' because the Early Grey stands out, partly for its subtle colouring and partly for its posture. It settles with its front legs stretched firmly out in front of it, in their woolly fell-walking socks. When I first encountered it - last week - I thought that it was an early Tussock moth; they have exactly the same habit, like a sheepdog waiting for instructions. Early Greys are very docile. To spice up the current grey/brown arrivals, I'm cheating a bit by carefully tempting them on to bright Spring flowers. Pugs won't do this; they zig-zag off in nervous fits. But the Early Grey came quietly, and indeed the species is known for resting openly during the day on tree bark or lichened rock, safe in its subtle camouflage. My final reason for liking it is that we mix Earl Grey with ordinary tea to make our morning brew, and very nice it is. 'Early' sounds like the sort of endearment Lady Grey might have used for her eminent husband, but I don't know whether she did. 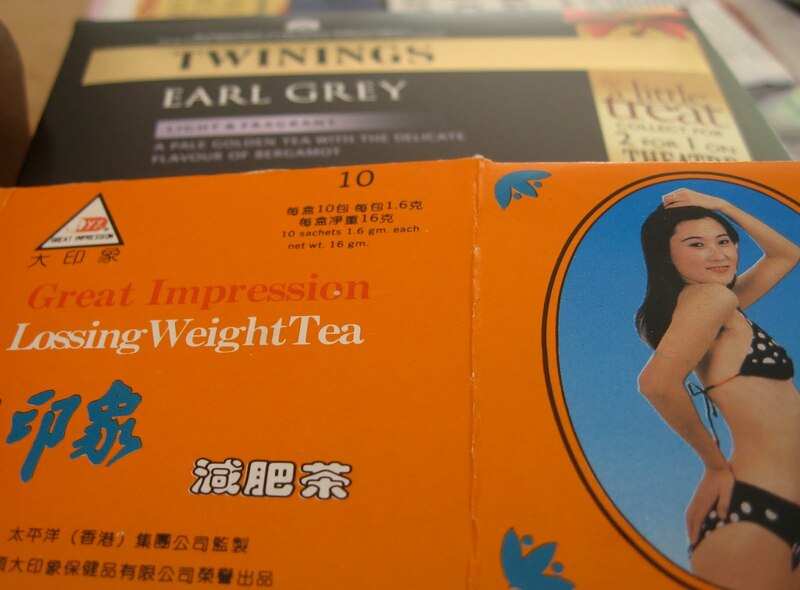 Here's a picture of our Earl Grey tea packet, along with a weird product I bought in Soho's Chinatown but have yet to try. Jessie's contribution today (below) rather shows that, however much we hype the patterns, socks and Beatle-y haircut of the Early Grey, Borneo's moths beat us every time. I will try to identify Jess's moths soon. I've got a massive book on exotic ones somewhere, and of course there's Google. Another night, another Satellite. And if you compare this one with its much darker relation several posts below, you can see how much variety there can be within a species. 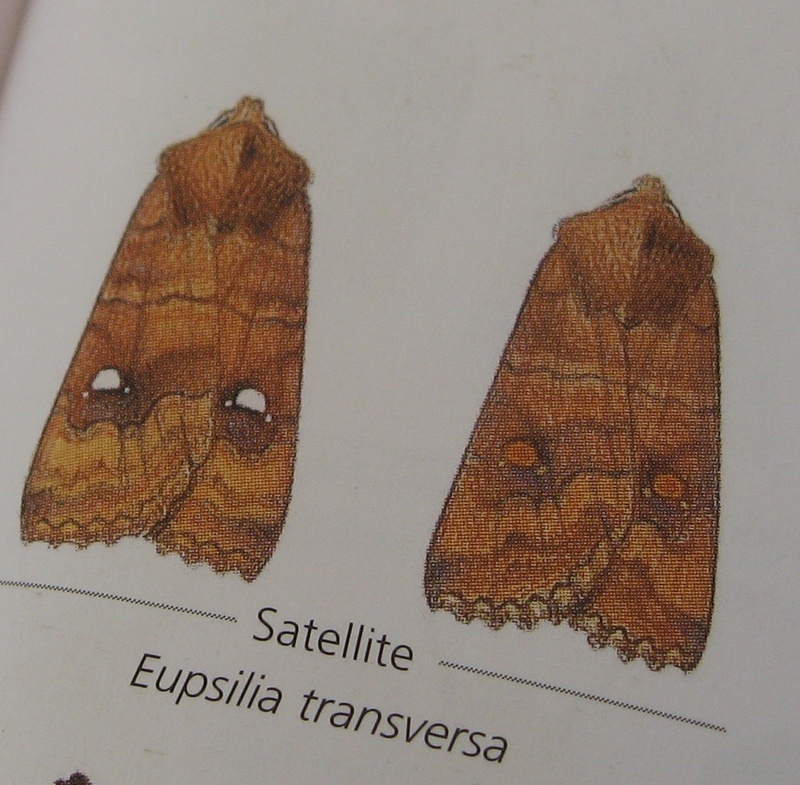 This is the bane of already dodgy identifiers such as myself, but adds interest to each moth. Look, even the little moon and its satellites are different from the other one's: orange this time, compared with creamy white. I've been reading a bit more about the Satellite and discovered that although it over-winters as an adult, it only becomes active in milder weather. I know people like that. I guess these two survived the ice and snow by crawling into a nook and staying wisely put. Meanwhile, another Jessie-photo too. She only realised after checking this lovely pic she took of a bright butterfly in Borneo, that just beside it (above and to the right with the little brown 'eyes') was a 'leaf' butterfly as well. Brilliant camouflage! There were many fewer moths in the trap last night; two dozen Quakers, Drabs and Hebrew Characters compared with over 50 on average this week. So that's my contribution to data on the first volcano day, Ash Friday (if I can add to the huge outpouring of Icelandic puns and jests). It may have been the cold, of course, but one possible field worth checking is the effect, if any, of the ash cloud on moths and the moon. There was only the slenderest of sickles last night - thank you Woodlands junior school in Kent which has an excellent Moon Site online (www.woodlands-junior.kent.sch.uk/time/moon/#2) - and conceivably the ash rendered it invisible. Linking moths and the moon is not lunacy. Authorities as eminent as Prof Edmund Ford, who went up in an RAF balloon in quest of knowledge on the topic, have speculated that there may be a connection with moth navigation, and disorientation by light traps. Today's picture is far away from this, albeit not as far as the moon. My niece Jessie has been in Borneo on a break from the iniquitous world of TV whose indie companies treat young researchers as underpaid slaves with no prospect of the commitment which I've enjoyed in my lucky life from employers. She promised to photograph butterflies, moths and bugs with her much greater skill and steadier hands than mine. Here's the first of a series, a strange little bird-like creature in a rumpled wedding gown on the hairy hand of one of Jessie's mates. I wonder if it had just hatched. Oh, forgot to say earlier that I've relearned how to put links on the blog and have added those of Phil, Ben, Matt and other kindly experts whose own accounts are much worth reading. I realise I may be testing the patience of those longing for vivid moths, but this humble arrival (above) isn't completely uninteresting. It looks like an early victim of the Icelandic volcano ash which is causing chaos to human flights. I wonder if collated moth trap information will show any difference over the next few days, as the ash drifts down to ground level (assuming that that is what it will do). I don't need warning about volcanic ash as an invisible enemy of machinery. We wrecked a nice camera simply by taking it up Vesuvius. You should have heard the camera shop man in Leeds, eloquent on the fiendish effects of the particles. Anyway, I think this is a Narrow-winged Pug, one of a tribe created by God specially to exasperate moth identifiers. Ben and Co will put me right if it isn't. The pair in the long thin picture look to me like Brindled Pugs, largely because this moth flies in March/April while most Pugs don't hatch until June or thereabouts. 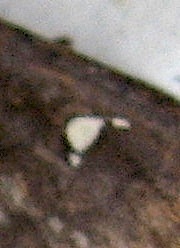 It's hard to photograph moths which insist on staying in the trap's black bowl. The darkness does something beyond my understanding to the camera's intake of light, even with digital's extra cleverness. Incidentally, I was up on the Roman Wall recently and the way the Narrow-winged Pug's eggbox has curled and jutted reminds me of the stretch at Cuddy Crags. Strange, how the mind works. Those mystified by moth enthusiasm may have their doubts increased by today's offering. Here are some of the trap's first arrivals - among 53 slumbering away - and I can't say that any of them are likely to draw new recruits to the study. Be forbearing though, and have a closer look. The patterning on the Hebrew Character is actually very delicate under close scrutiny, as is the Common Quaker, for all its rather plain, Jane Eyreish appearance at first glance. The other thing about these types of moth is that they challenge my notoriously weak identification skills, and I thank the Lord for my expert Commentors who often put me right. I will stick my neck out as usual, however, and say that they are, from the top: Hebrew Character (for more about the name see post on 5 September 2008), Common Quaker, Clouded Drab and Small Quaker. In my lifelong absorption with butterflies and moths, I have never known anything as effective at catching them (temporarily) as the light trap which brought joy into my life thanks to Penny's secret birthday planning, five years ago. But there are other methods which also don't have the downside of my schoolboy net, which meant curtains (it was muslin, appropriately) for the insects. You can track down caterpillars, for example, by checking their foodplants at the right time of the year. Nettles in late May and June are specially good for the Vanessids - Small Tortoiseshell, Red Admiral and Peacock - though remember that they sting. The nettles, not the caterpillars. It is also rare to pass a year without meeting a 'woolly bear', one of those hairy moth caterpillars which are intrepid pedestrians. They always seem to be going somewhere. Keeping caterpillars to pupation is a bit like having pets - constant feeding, familiarity with poo etc - but the reward of actually watching a butterfly or moth hatch is stupendous. And now, this post's photograph. Pupa-hunting always struck me as a boy as the dreariest of pursuits. Romantic accounts of digging beneath appropriate trees didn't acknowledge the boredom and lack of rewards. But there are people who like fishing in canals, which seems to have about the same level of excitement. 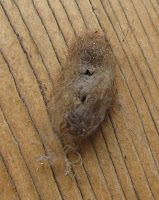 Serendipitous pupa-finding, however; that's another thing altogether. And here are two chrysalises, both vacated by their former occupants, which I just found while cleaning out flowerpots. One was an inch below the surface - imagine the force of instinct which gets a caterpillar to bury itself. The other was under the pot, tucked up inside the rim. 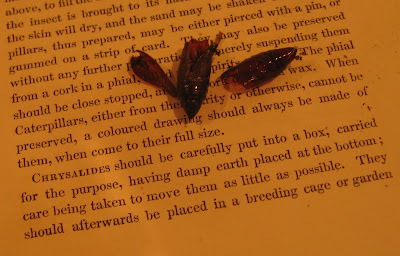 I've displayed them on an extract from The Butterfly Collector's Vade Mecum which Miss Laetita Ford published in 1836. It's a great book. More moths soon, but I can't resist diverting just for today to butterflies. We hear an awful lot about their decline in the UK, especially in the national media. Having worked for that for nearly 40 years, I have a healthy scepticism and this weekend it was reinforced. What we lack is not butterflies but sun. Out it came, wonderfully, and out came the butterflies too, just like all the people who were sunbathing - yes, in early April - in the grounds of Kirkstall Abbey, another practice which the glum would have us believe to be a thing of the past. At home, we had this Comma, several Peacocks and a Green-veined White and my Mum reports from three miles away: "I have been watching a small dark butterfly on a sunny wall. I am sure it is a butterfly and not a bumble-bee." It looks duller this Monday morning, but I live in hope. The answer to the difference, I think, lies in the long life this moth will have led (and long may it continue, now that I have tucked it away to slumber under a leaf). Satellites hatch from cocoons underground in September and spend the winter as adult moths. So this one will have had to put up with the snow and icy temperatures just like us, and in the process its original brown brightness has dulled. The other new arrival is this Twin-spotted Quaker, another moth named for the distinctive marks on its otherwise restrained and Quakerish plumage. I am just about to write a Guardian 'In Praise Of...' leader about the Quaker philanthropist and poverty expert Seebohm Rowntree, so I named this particular moth after him before leaving it to doze on. I'm also pleased that WT&L described it as 'more local' - ie rarer- north of the Midlands. So it has an extra interest as a new arrival here, in terms of the number of moths which seem very wisely to be moving North. If my identifications are correct, which as regular readers know is by no means certain, it joins lots of Common Quakers such as the one beside the Satellite in the main picture of this post. We're off! The incomparable Watkins & Doncaster delivered my new bulb yesterday morning early and here it is, shining brightly, while our house gleams cosily in the background with Penny and me dozing off inside in front of Outnumbered and the news. It was a good night thanks to the sudden and lovely arrival of Spring. I've seen 60 of these now and yet I'm still ambushed by the beauty of it all. Amazing how every winter you forget. I went to Sunderland today on election duties and all the way there and back, the surroundings were stupendous. Much as I like daffodils, it was great to see primroses and cowslips on the A19 and the chionodoxas in Sunderland's many parks were just lovely. Aaaah! My other picture prompts a case of Arthur Koestler-style coincidence. After I'd taken it and transferred it to the computer, I just checked out the comments on this year's first post, below, and then clicked across to Mike Beale's excellent blog Norfolk Wildlife (http://norfolkwildlife.blogspot.com/) and saw that he's also just got a new mercury vapour bulb and is so excited about it, just like me, that he's posted a pic too. My only extra is the remains of my old one, which rolled off our rockery and smashed on the very last day of moth-recording last year, with a satisfying but expensive 'poooof!' as the vacuuum de-vacced itself. I am very bad about organising links to other blogs such as Mike's, or becoming a follower, but I will try to put this right when I have time and possibly a son at home just to help me through the tech steps. The Morris Minor van incidentally, is for scale although Penny pointed out in her usual practical way that since people will not know whether it is a Dinky toy or a Matchbox one, it is not very helpful. So let me add that it's a Matchbox, in the livery of that great old shop Brown, Muffs of Bradford, alas now gone along with the J B Priestley pie shop. I'm doing a Radio 4 archive hour about Priestley's Postcript broadcasts later this month, and the pies will get their due. Hurray, the moths are back! 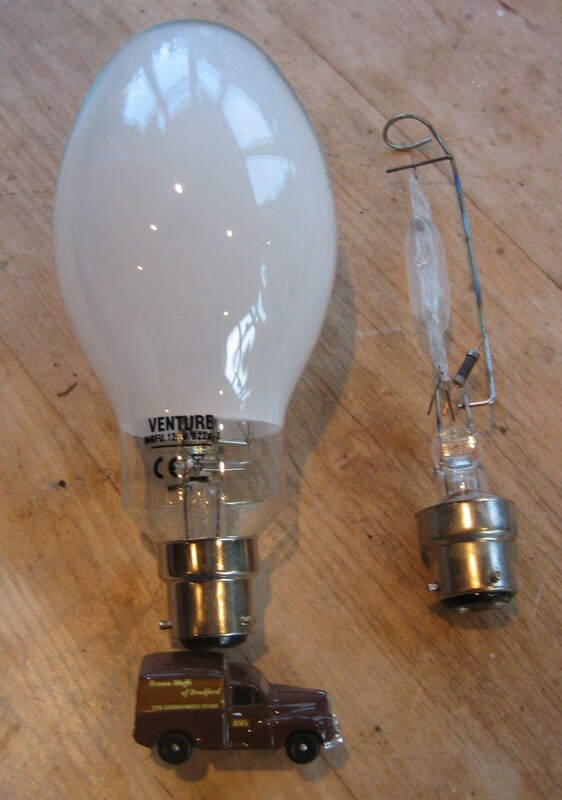 And earlier than ever this year, though I'll not be recording any moths 'til a new mercury vapour bulb arrives from Watkins & Doncaster (see last year's last entry but one for the Great Rolling Off the Rockery Disaster...) Actually, I will have two new bulbs, cos my age and technical incompetence meant that I did the online order twice. I nearly squished it, but then thought: it's always handy to have a spare. So, out with the brushes and dusters, and if you are really scientific, sift your Hoover dust before putting it on the flowerbeds or in the bin. More soon, though possibly not tomorrow or for a day or two, unless our cleanup flushes out more treasures. Doesn't our carpet look interesting close-up in the top pic, btw? As always, click or double-click on the pics to make them bigger. 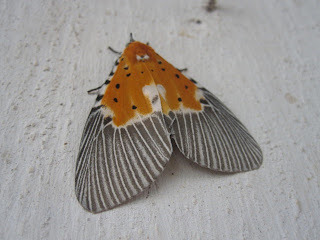 United States' finest painter - soon to include a moth?